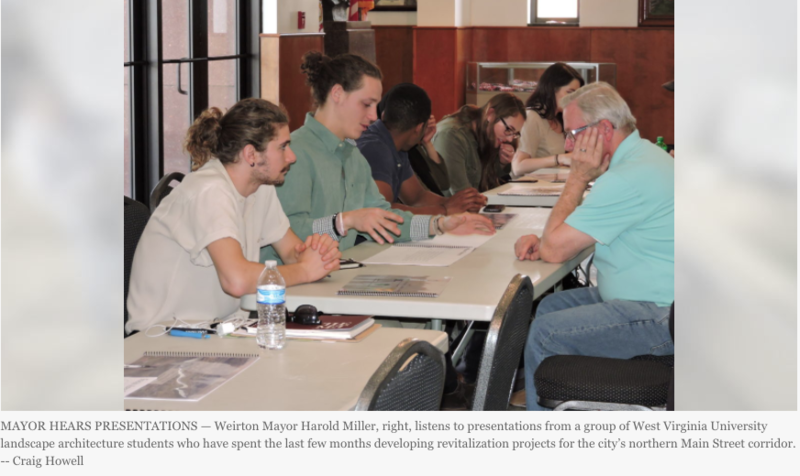 WEIRTON — Working since January, a group of West Virginia University students have been meeting with residents and officials and studying the community to develop proposals for potential revitalization projects in Weirton. Monday, they made their final presentations for the city, showcasing their ideas for the public at the Millsop Community Center. “We have several draft master plans and designs,” Anna Withrow said. Withrow is the course instructor in charge of the project and a project manager for the Northern WV Brownfields Assistance Center. Projects from the more than 20 students included ideas for greenspaces and recreational areas, walking and bicycle paths, housing and business development focusing on the northern Main Street corridor. Particular attention was paid to the Main Street and Cove Road intersection, as well as the intersection of Main Street, Pennsylvania Avenue and County Road. Proposals were refined by the students through feedback obtained during two public workshops held in Weirton. Withrow noted while the class is coming to an end, the proposals will still have benefit for Weirton. “The students have dug up all this research,” Withrow said, noting the information could be valuable for the city’s future. Weirton Planning and Development Director Mark A. Miller, among those in attendance Monday, said he would like to include the proposals as part of discussions for a master reuse plan currently under development for the property purchased from ArcelorMittal by the Frontier Group of Companies in 2017. With funding from the U.S. Economic Development Administration, the reuse plan is being developed through the efforts of the Frontier Group, the City of Weirton and the Business Development Corp. of the Northern Panhandle.